My fridge has condensation on the ceiling, shelves, crisper, and containers on the inside of the refrigerator. What causes this? I wiped the condensation off everything and after about 12 hours it was back. I opened the fridge door and I found extreme condensation everywhere. It was on the ceiling and shelves but also on all the items including cans of food and drinks. I keep the fridge completely full since that is best for keeping things cold. I checked around the magnetic edges of the door seal and it seems to be a good tight seal. What else could cause all this extra condensation? Possible cause 1 – If you have made no changes to the refrigerator temperature dials or have not added hot foods in the fridge then it may have been just a really humid or moist day. Depending on where you live, also if you are using AC in your home, condensation can build in the fridge if there is a severely humid or even a rainy day. Possible cause 2 – The fridge door may have been left open slightly for a few hours. 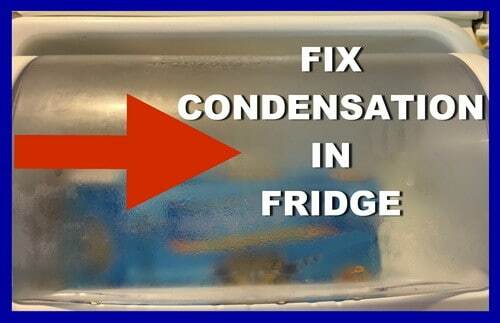 If the door is left open for even 20 minutes or so, condensation will build up on the inside of the fridge. The solution to this is to simply always make sure you have shut the fridge door after using it. Put a note on the fridge if it happens often to remind you. Possible cause 3 – On certain newer style Samsung, LG, GE, and Whirlpool refrigerators with the freezer on the bottom, if you shut the freezer door too hard, it will pop the fridge door open. Shut the doors gently on both the freezer and the fridge. 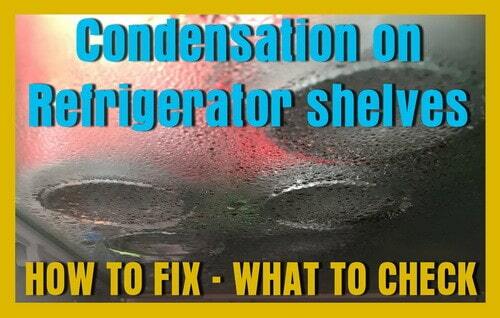 Why is there condensation on my fridge shelves? 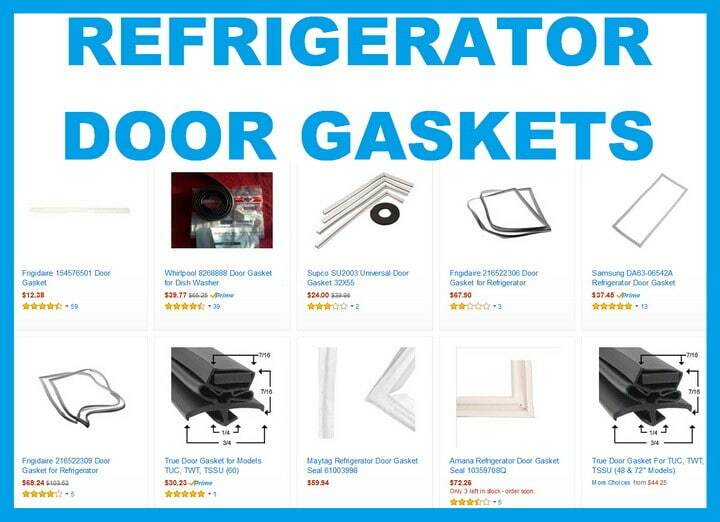 Possible cause 4 – If the refrigerator door gasket (magnetic) is worn, ripped, or falling off, this is often the cause of refrigerator condensation. Check the door gasket to be sure it is not causing the condensation problem. Inspect the gasket for blackening caused by mold. Try the MONEY TEST… close the door with a dollar in between the refrigerator and door gasket. The door gasket is NOT sealing properly if you can pull the dollar out easily with no resistance. If this is the case, order a new refrigerator door gasket. Possible cause 5 – If you have a self defrost refrigerator… the defrost drain line may get iced up. If this happens then turn off the refrigerator and let it manually defrost. You could try hot water in the refrigerator drain line which should be just as effective as a manual defrost. The drain hose can get blocked by ice or other objects stuck in it. Try pouring hot water or blowing air into it with a straw or an air compressor on a low setting. Refrigerators have a drain. Look inside your fridge for a V shape drain with a small hole. The hole will lead to a tube. The tube goes to a pan that lays on top of the compressor. The automatic defrost cycle lets the water run into this hole and down into the tube. When the water is sitting in the pan on top of the compressor, the heat of the condenser/compressor makes this water evaporate. That tube could be clogged therefore causing excess condensation. Clean it out if you suspect this to be the reason for excess condensation. 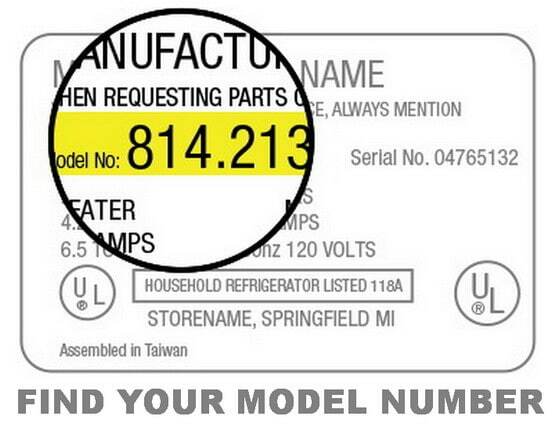 Need help finding the model number of your refrigerator? BONUS TIP: Is your fridge level? Turn the front legs to become a little longer. This makes it so the condensation will move to the back drain and not inside the fridge. Admiral, Norge, Roper, Estate, Sears, and Kenmore refrigerators. Common problem with any self-defrosting refrigerator, freezer. The water drains become plugged up and unable to function. The result is water collecting where it should not. 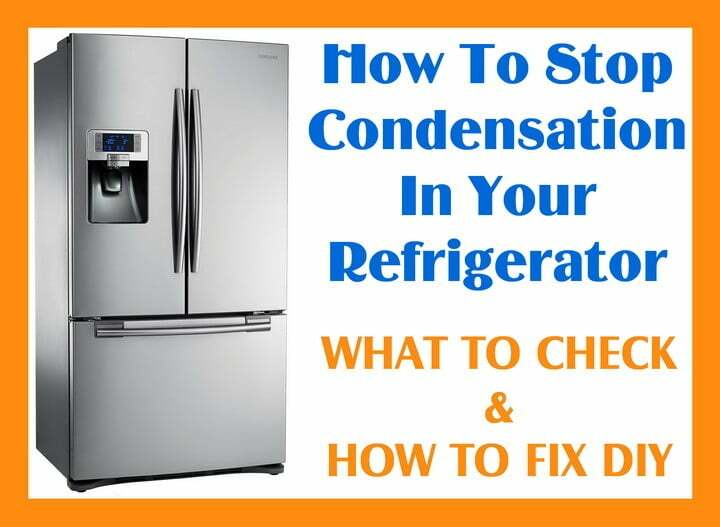 If you have other reasons why a refrigerator has too much condensation and what may be causing it, please leave a comment below. It seems the condensation happens where the air circulates between the freezer and the refrigerator. The colder air coming from the freezer enters the refrigerator through a louver right above the glass shelf on top of the vegetable crisper drawer. The cold air causes condensation on the underside of this glass shelf. Any remedies? Next post: GE Refrigerator Water Filters – How Often Should I Change The Filter?